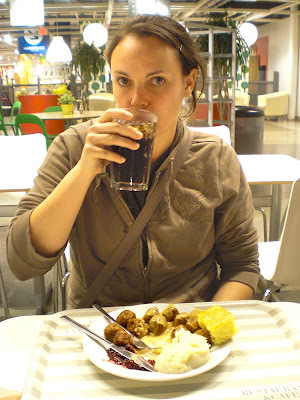 It's been a while since I took Jen out for a romantic meal, so tonight we put on our best t-shirts and headed out to Ikea. We chose to partake in their much publicized "plastic tray" self service option. 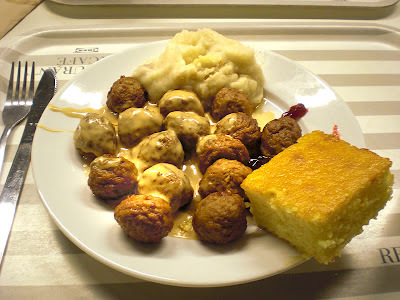 After careful perusal of their menu Jen and I both opted for their classic meatballs and mashed potatoes. The meal was complimented with a fine bottle of bubbly...orange juice and a diet coke. Perfect ambiance under Ikea's romantic lighting. Hopefully we'll find a special occasion so that we can return to this fine restaurant in the near future.